As always, my biggest job was leading worship for the conference. 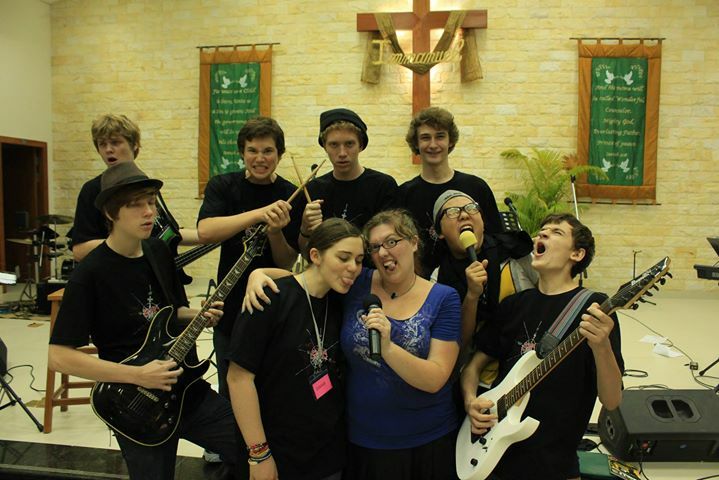 This year I had a team of 7 very enthusiastic and very skilled young men to lead (plus a sweet girl giving me some extra help on vocals for most of the conference). I had a great time with them. I was very impressed with their skills, and their good hearts. Our practises were raucous and joyful and thoroughly wonderful. I had a bit of a cold and lost most of my voice by the last day of the conference which was interesting for singing!! In addition to leading worship and general conference stuff, I also led one of the small groups. This year’s conference relied heavily on a small number of quality small group leaders; the small group times were a BIG part of the experience for the students. I had a group of grade 12 boys, many of whom I’d known for 4+ years, and one lovely girl from Fiji (who was visiting for a few weeks that overlapped with the conference time). We had a great time together, with interesting conversations and some laidback silliness I think all teens need in their lives. My group, and another group, chilling at Blue Pumpkin – awaiting our turn to chase each other around at Laser Tag. You can read more from students who attended the conference on the EPIC website testimonies page. After the conference, Christina and I took a few days away, going to the White Elephant resort outside the city for some R&R. It was a lovely time of relaxing, reading, swimming, and hanging out together. There’s a good chance we won’t see each other again before Christina moves to the US in June, so it was really nice to have that time together after the busyness of conference was over.